Don't you just love it when your kids are on their way to bed and they say something like, "Hey, Mom, I forgot to tell you I need _______ for school tomorrow." The blank is almost always filled with something that's going to take more than a few minutes if not hours. 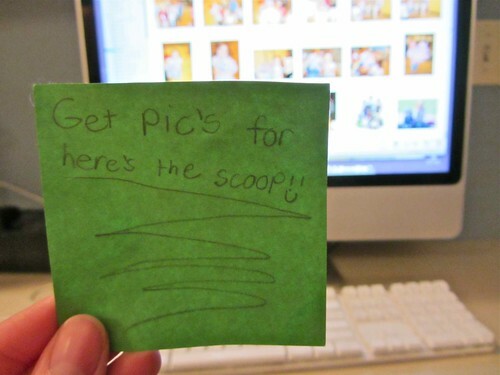 She needs four pictures of herself for a board in her classroom that says "Here's the Scoop On". She is one of the students being spot lighted. That's great but having the info on Monday after school would have been better. I had to go through over 5000 pictures to get the four. Sometimes it's very hard to choose just four. Oh, that reminds me, I have to buy some drink in 2L bottles so she can take in the empty 2Ls to make an aquarium. She probably needed that yesterday. Oh, well.